As the site of the annual Volvo Cars Open (formerly the Family Circle Cup), the Family Circle Tennis Center on Daniel Island has an extra-ordinarily high profile. Its 17 beautifully landscaped and spaciously laid out courts—one of them a 10,000-seat stadium—fan out round a handsome two-story clubhouse with an expansive pro shop, cherry-wood floors, locker rooms, and a small fitness room. It looks like a posh private club; in fact, it's a public facility, open to anyone who wants to play on its Har-Tru or hard courts. But Daniel Island is not a resort; it is a master-planned residential and business community with schools, churches, a bank, shops, restaurants, and a medical center. You can vacation there by booking a room at the Hampton Inn, a few blocks from the tennis center, and taking advantage of the island's bike and jogging paths and its nature preserves, dining in any of half a dozen restaurants, or using it as a base for exploring Charleston, a 20-minute drive away. However, like the residents you'll have to leave the island if you want to go to the beach. Alternatively, you can stay anywhere in Charleston. Tennis Staff. The tennis director is Jim Dempsey. He played No. 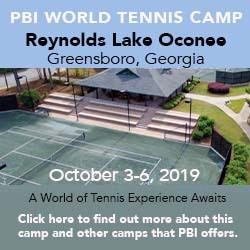 1 singles and doubles for Francis Marion College in Florence, SC, headed out on the satellite and challenger circuit, worked part-time with juniors at the Hopman Tennis Programs and for LGE, and coached several women on the WTA Tour, among them Pam Shriver, Lori McNeil, and Lisa Raymond. Along the way he managed clubs in Ohio and Florida before coming to Family Circle in 2003. Tennis Programs. Given that this is part membership club, part public facility, the tennis staff has had to feel their way toward programs that make sense for this unusual hybrid of players. One element is a very strong junior program. Although designed for local kids, it has a growing reputation for the quality of its programs and thus has been attracting strong juniors from outside the area on weekends. Adult programming so far remains limited to a few weekly stroke-of-the-day clinics and sessions of advanced drill, only because that's all there seems to be sufficient demand for. They do, however, offer a package for teams, which bundles 8 hours of workouts and clinics over 2½ days. "We want to give them a world-class instructional program while leaving time to take advantage of Charleston," says Dempsey. Courts & Fees. The club has 13 Har-Tru and 4 hard courts, 13 of them with light. One is a 10,000-seat stadium, another located at one end of the clubhouse at showcase grandstand court. All have shaded cabanas and water fountains alongside. Court fees: $10/hour on hard courts, $15/hour on clay (add $2/hour for lights). The closest lodging to the Tennis Center is the Hampton Inn-Daniel Island. Its 128 rooms all have in-room coffee maker, free airport shuttle service, and TV with cable. We also offer connecting rooms, cribs, hair dryers, irons, microwaves, refrigerators, safe deposit box, high speed Internet access. It also has an outdoor swimming pool, small fitness center, and a guest laundromat. Check special internet rates at other Charleston hotels. The closest accommodations are at the Hampton Inn on Daniel Island. That said, given the attractions of historic Charleston, you may want to stay there, instead. Accommodations in Charleston. Travel Instructions. Charleston International Airport is 8 miles from the hotel. Take I-526 to the Daniel Island exit (#24). Make the first right onto onto Fairchild Street and follow it to the hotel. General Tourist Information. Visit the Charleston Visitor Reception and Transportation Center website or contact them at 375 Meeting St., Charleston, SC 29403. Phone: 800-774-0006. So far, I haven't received any written feedback on Family Circle Tennis Center. If you've taken a tennis vacation there, I'd like to hear your reactions.